Earnings estimates rose past week. Over the last week, forward-four-quarter estimates for the S&P 500 Index rose 0.6%, and have risen by an impressive 1.3% since April 1. With 464 S&P companies having reported, first quarter S&P 500 earnings are tracking to a 26.2% year-over-year increase, while 79% of companies have exceeded earnings targets. Another 22 index constituents report results this week. We recapped earnings season in last week’s Weekly Market Commentary. Trade war on hold. Treasury Secretary Steven Mnuchin, who is leading U.S. trade negotiations with China, indicated that the trade war is “on hold,” sending stocks solidly higher globally and pushing the U.S. dollar higher. China promised to meet one of the United States’ primary demands–to buy more U.S. goods–while the U.S. won’t impose tariffs on Chinese imports, at least not now. Our view has not changed, i.e., a trade war will be averted and bilateral agreements with China will be reached. We continue to recommend EM equities exposure for tactical global asset allocations. Emerging market (EM) equities have given back their strong early early-year gains, pushing the MSCI Emerging Markets Index into negative territory year to date on a total return basis. Many headwinds have weighed on EM stocks, including rising interest rates, U.S. dollar strength, and trade war fears. We expect strong economic growth to help EM offset tighter monetary policy, higher interest rates in 2018, and potential further U.S. dollar strength. In today’s upcoming Weekly Market Commentary, we highlight five keys to our EM outlook. Where does the U.S. dollar go from here? The U.S. dollar has come back strongly over the past several months. After losing nearly 10% in 2017 and an additional 4% in January, the U.S. Dollar Index has rallied more than 5% off of its February lows. Gains have been driven by several factors, particularly rising U.S. interest rates, partially due to increasing Federal Reserve (Fed) rate hike expectations, and repatriation of overseas profits as prescribed by the new U.S. tax law. The dollar is important for many reasons, including its impacts on international trade and overseas corporate profits. So, where does the dollar go from here? We discuss in today’s Weekly Economic Commentary. Week ahead. This week is highlighted by the release of the Federal Open Market Committee minutes from the May meeting, as investors will continue to look for clues regarding if two or three more hikes are likely in 2018. In U.S. economic data, the Chicago Fed National Activity Report is being released today, while existing home sales and durable goods orders come Thursday and Friday, respectively. 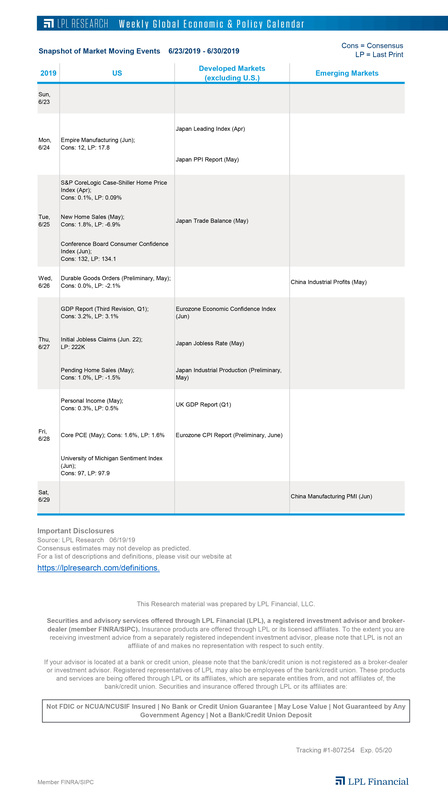 Overseas, gross domestic product (GDP) and Purchasing Managers’ Index data highlight the docket in Europe, while Japan reports trade balances for April and inflation data for May.